The problem: Not all sources are created equal. The solution: Keep it REAL–4 Easy Steps to credible & authentic source material. Yet, when it comes time to incorporate source content into their writing, we want students to go beyond that one easy step. Our students have an enormous amount of information at their fingertips. And therein lies the difficulty. They literally carry around so much data in their smartphones, it’s enough to make a grad student’s head spin, let alone a frosh college student, or the high school set. As we know though, all internet sources are NOT created equal. From paid links, to content farms and the like–what steps can students-and the rest of us–take to analyze a source for credibility? By using this handy chart with the mnemonic REAL , they will be able to sort through a lot of the “junk” that’s available and find a nugget of REAL, and credible information. The four quick and easy steps are: Read the URL. 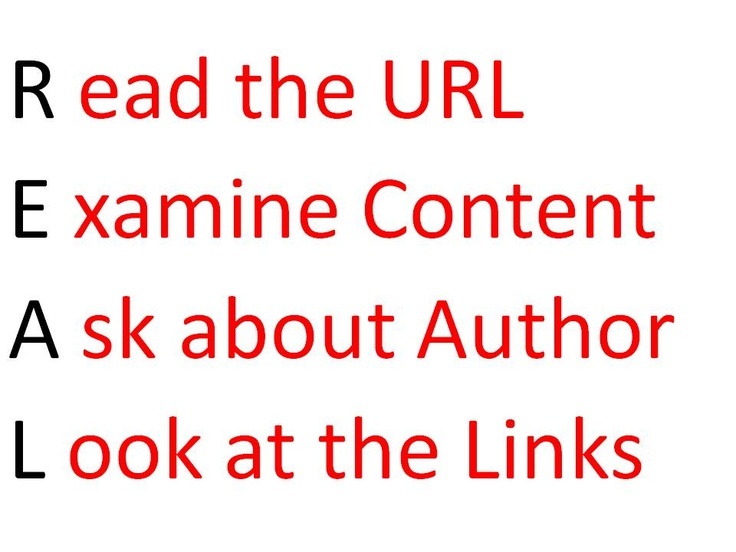 Examine Content. Ask about the Author. Look at the Links. Use an in-class discussion to educate students on the importance of each of these four categories, using the chart as a guide while you talk. Have a variety of articles related to the same topic, but from different websites, ready to look at on your smartboard, so students have a visual for the type of comparisons and analysis that is involved. There are other approaches to this question of source credibility. However, I’d rather give my students a quick and easy tool that they are likely to actually remember and use, then a long, pragmatic list of filters and variables that will cause their eyes to gloss over. So, when it comes to source credibility, let’s help our students keep it REAL. What do you think–is this an approach that would work in your classroom? Or in your own professional writing? If you’re a student, would this method help you? I’d love to hear from you! Categories: Education, Reading, Teaching, Writing | Tags: college, critical thinking, education, google, news, online, research, students, teach, writing | Permalink.